Punchcutters in the 20th century seems to have mostly used 2 kind of loupes for punchcutting: traditional jewellers eyepieces (you can see P. H. Rädisch and M. Carter using them at Enschede in several pictures) or a more sophisticated loupe on a stand like they use at the Imprimerie Nationale (C. Paput, Nelly Gable). Stan Nelson also has a beautiful one. 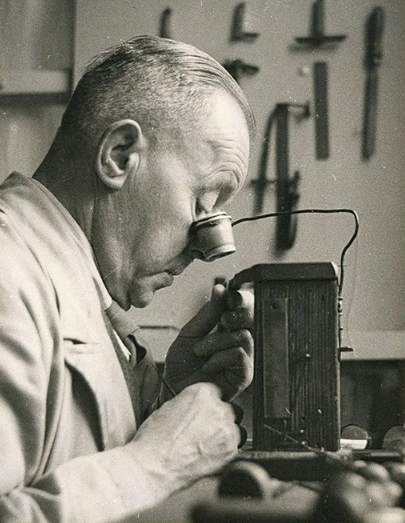 In his book Paput recommends "a magnifying glass on a stand, with a power of 3X and a diameter of 3,5 cm, which is reduced to 1,5 cm with a mask in order to eliminate distortion." 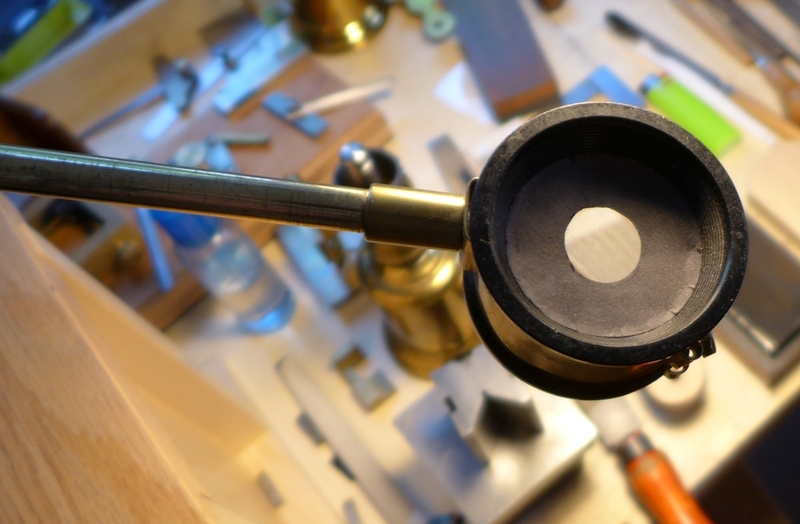 I tried several jewellers eyepiece but I've found them very uncomfortable and distortion prone, so I started to look of a magnifier similar to the one used by Paput, Gable and Nelson. This double lens magnifier by Bausch & Lomb has an excellent optic with very little distortion: http://www.bausch.com/our-products/vision-accessories/professional-magnifiers/double-lens-magnifier. 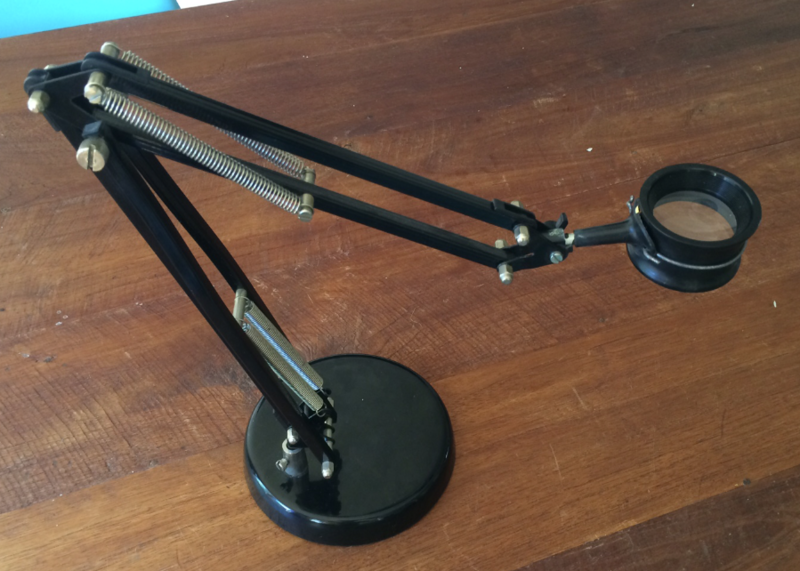 It was quite easy to attach it to the articulated arm of an Ikea desktop lamp. It works very well and can be place at any distance from the punch. 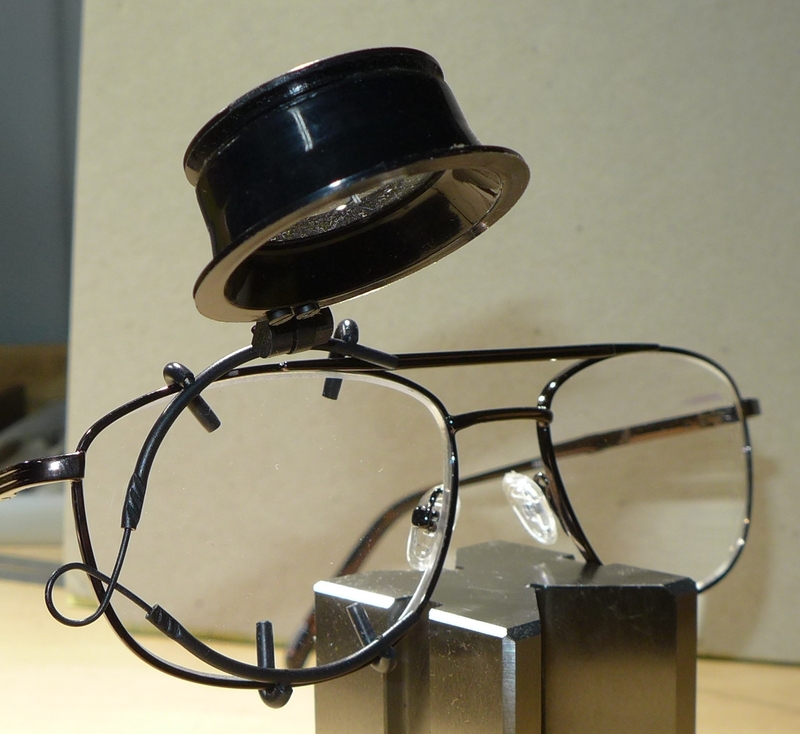 Loupes. As preferred. 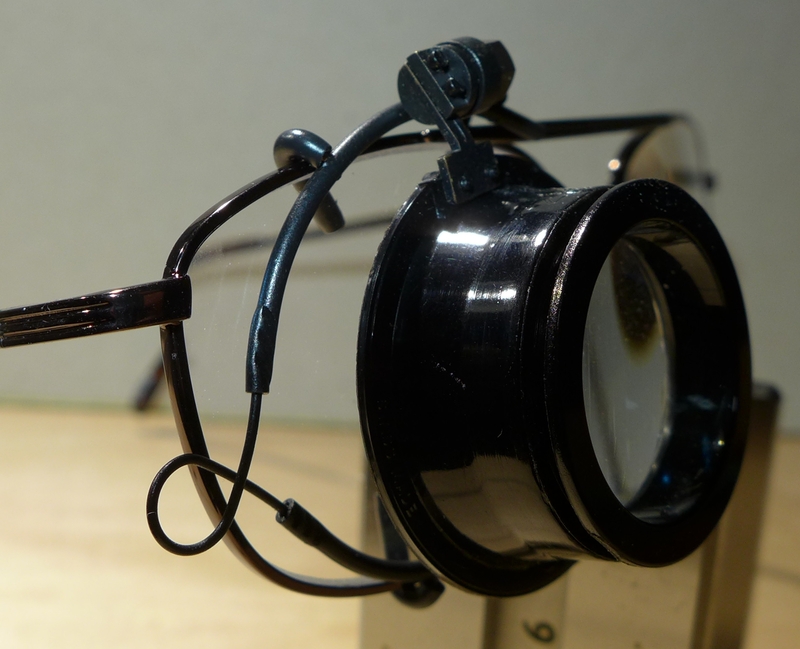 I like a 5X loupe; others need less magnification. 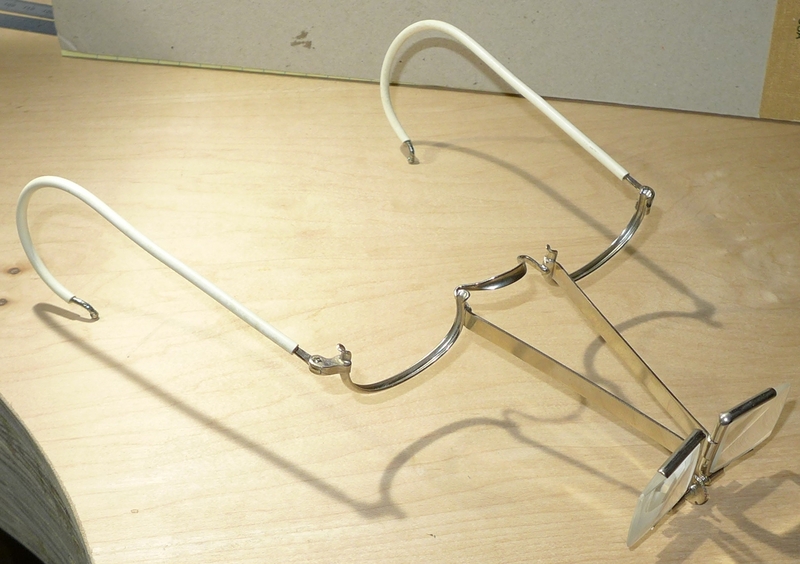 Flip-down loupes that attach to your eyeglasses. Swiss watch materials firm Bergeon. Not cheap, but nice. glass lenses (better), the cheaper LX series has plastic lenses. The number indicates the diopter, not the magnification. (1/focal length, in meters) and so can always be stated precisely. I really like Ramiro's idea of using a lamp base. One other, completely different, route is to use a stereo inspection microscope. The late Jim Rimmer used one, and I have been told that Richard Årlin (Stigbergets Stamp och Press) uses one today. The working distances of a stereo inspection microscope are very different from those of a loupe, though. I couldn't figure out how to make one bench setup work for both. 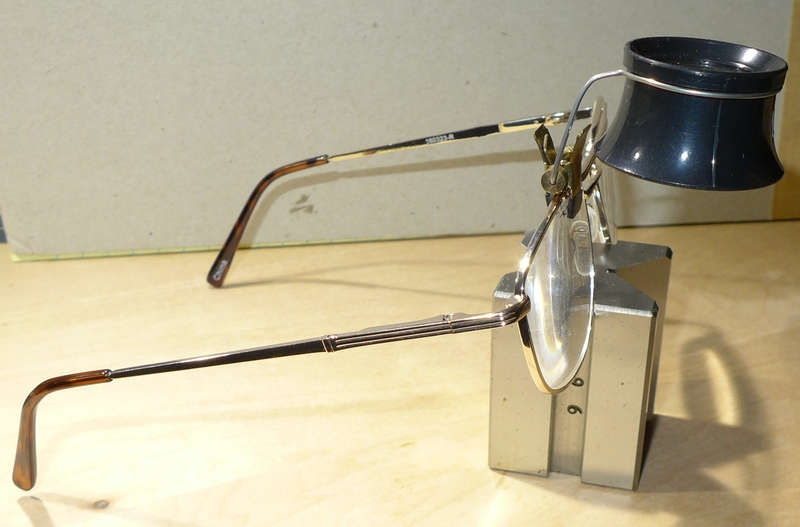 At the risk of boring everyone completely, here are some images of some of the head-mounted optical aids mentioned. I'll do this in four successive posts, otherwise I'm sure to scramble the images. 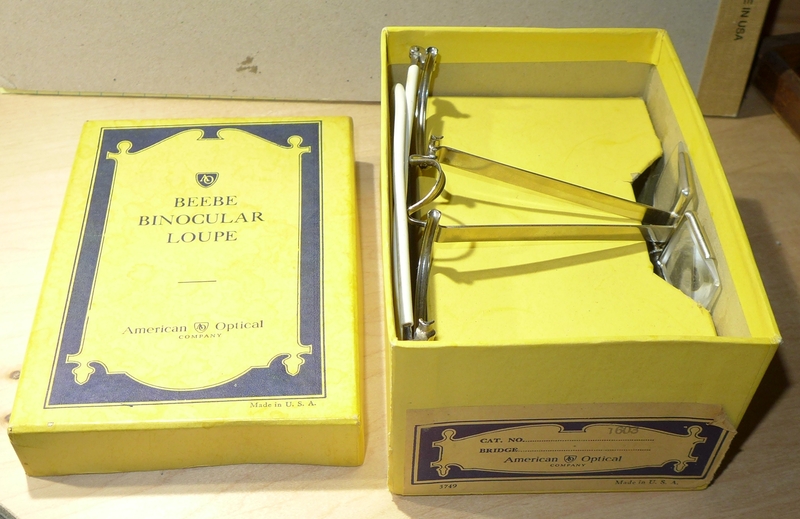 So first here is the "Ary" (brand name / model) flip-up eyeglass-mounted loupe marketed by the Swiss watch tools supply wholesaler Bergeon. It's a bit expensive ($80). You can get it in left or right eye versions. You can also get it in different colors, which sounds frivolous until you have two of them of different magnifications. 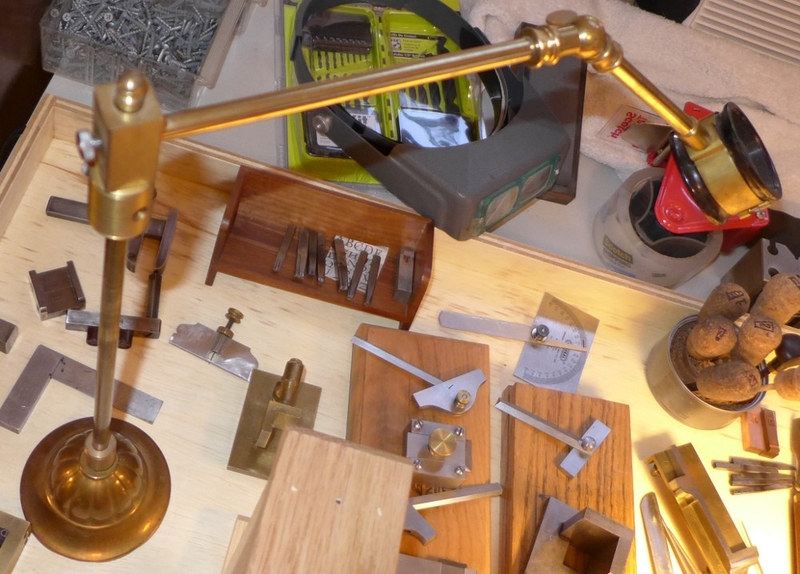 They're available from watch repair supply houses such as Otto Frei (in their ofrei.com division) and Esslinger. The item that you get for your $80 is just the flip-up loupe itself. 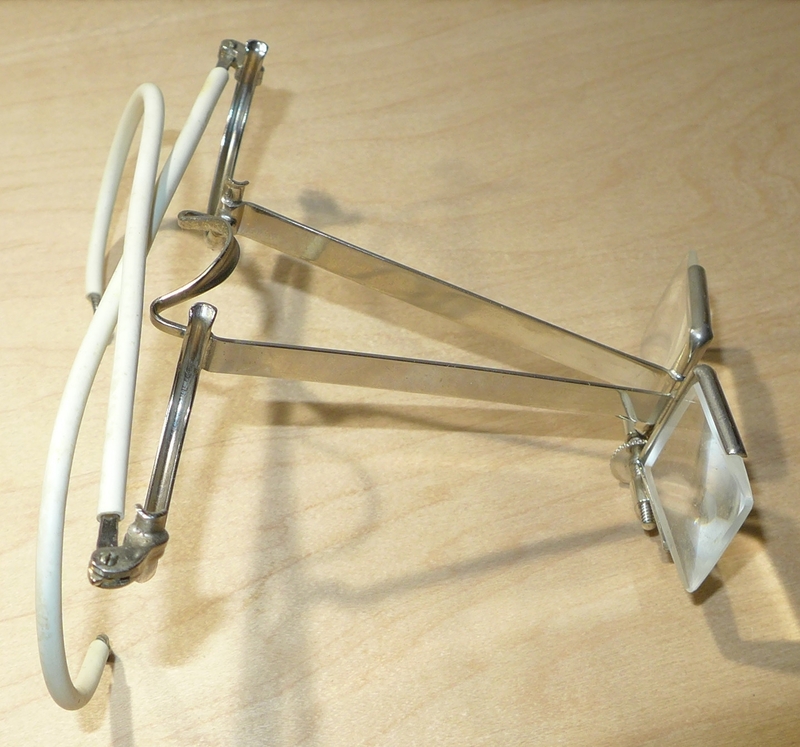 In the photos below it is shown attached to a pair of cheap non-prescription reading glasses. 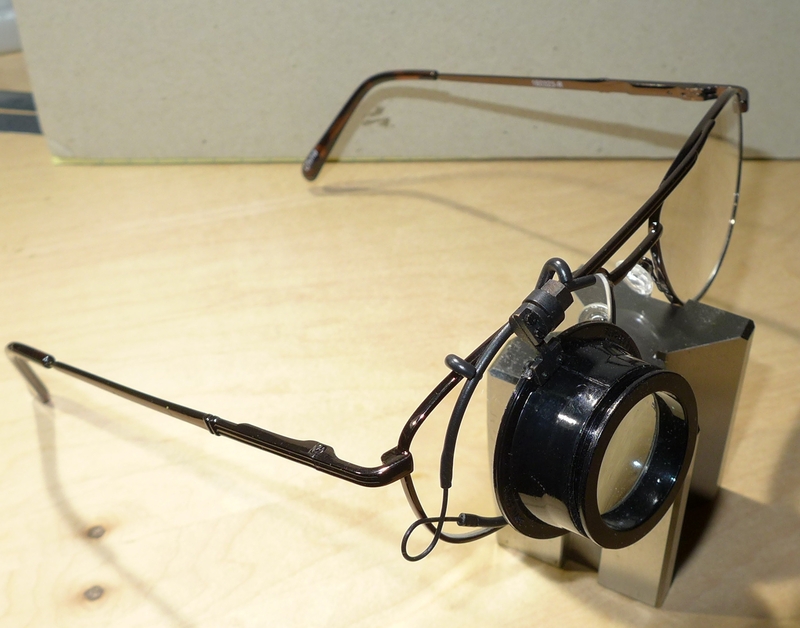 If you have to wear glasses anyway, as I do, having a flip-up loupe is very convenient. 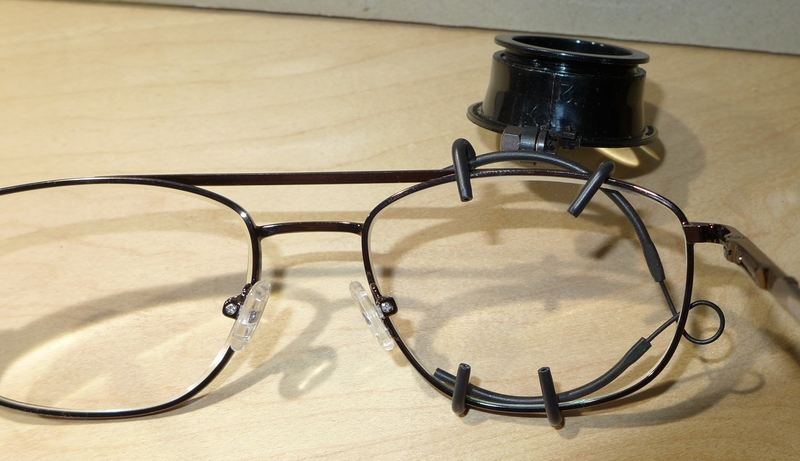 You might think that the bits of wire which come around the frame of the glasses would be distracting, but they're not. So that was the expensive "Ary" flip-up loupe. Here's the inexpensive Chinese version. I forget what they cost, but it wasn't much. They're ok, but they don't hang on to the glasses as well as the Ary. 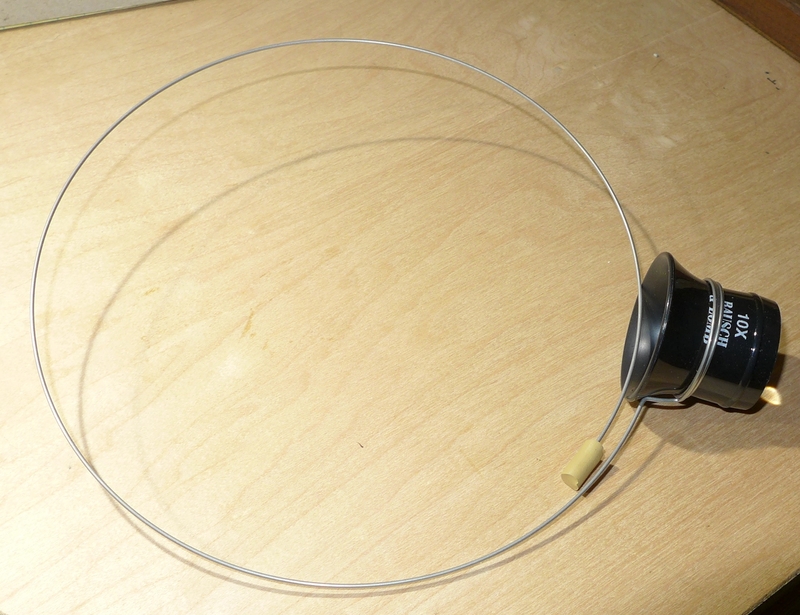 And here, just for reference, is the standard head wire you can use with most regular loupes. It's available inexpensively from watch tool houses. 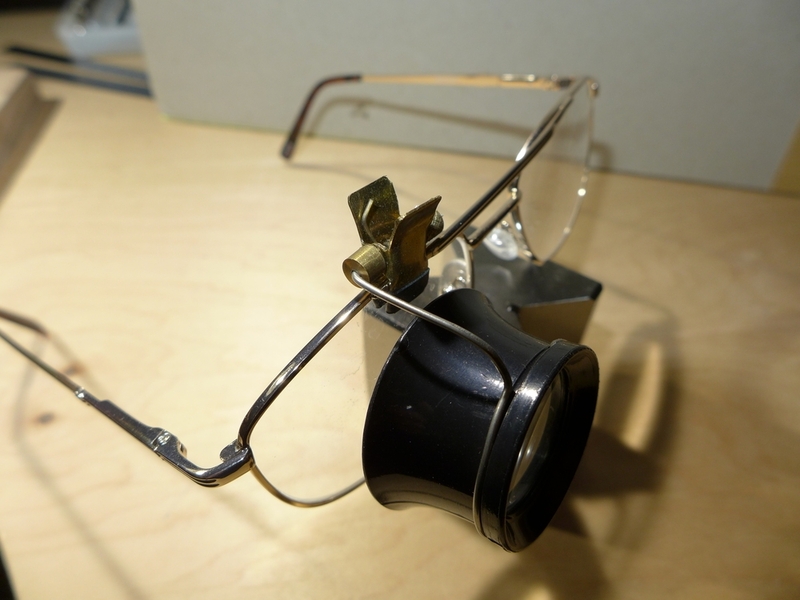 (It's shown here with a 10X loupe, which is probably too strong for regular punchcutting.) Generally the loupe is sold separately. And finally here's something just for the fun of it. 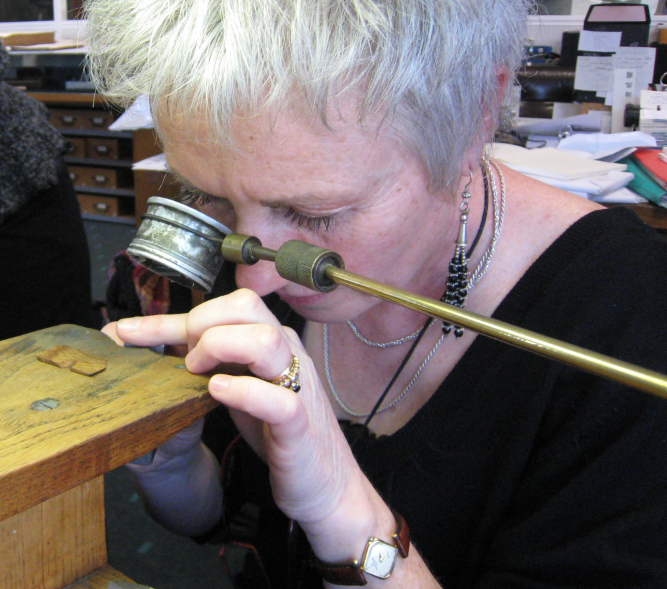 When we took Stan Nelson's punchcutting class at Wells College last year, we got to see the Victor Hammer materials preserved in their library (he was at Wells in the 1940s and cut punches there). 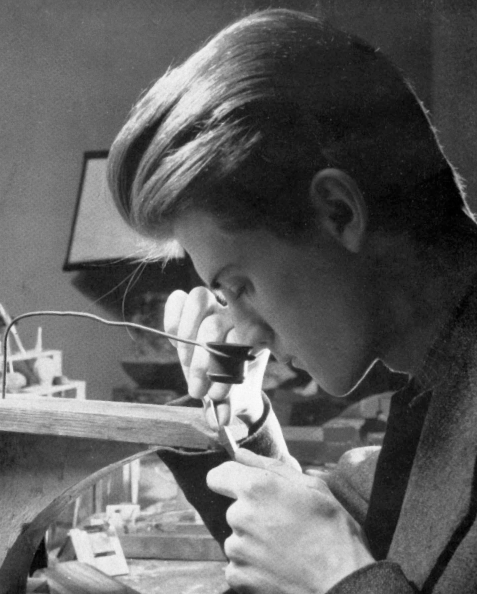 In some of the pictures of him, he's shown wearing an optical device which isn't generally known today. 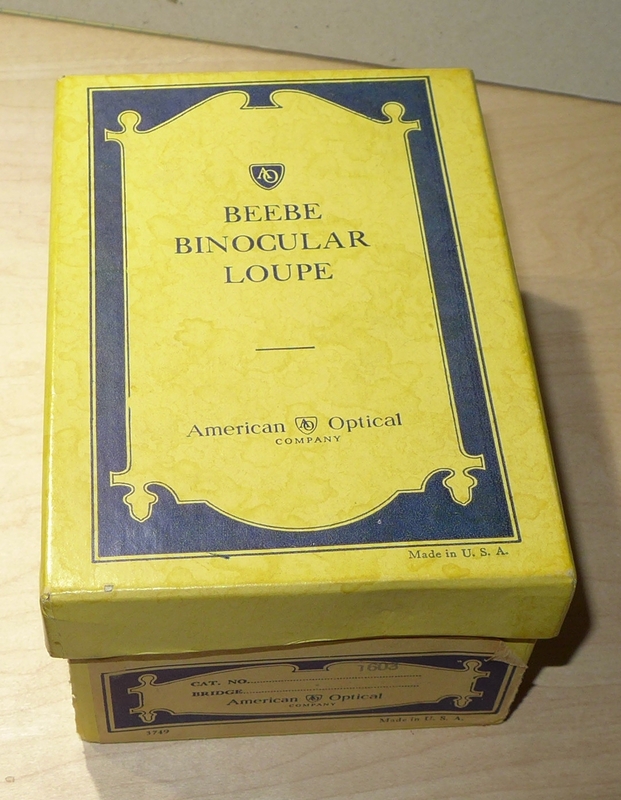 It was common enough in his time: An American Optical Co. "Beebe" (brand) Binocular Loupe. I don't use one myself, but my late wife was a Steampunk jeweler and she swore by them. Here are several views of a pair in particularly fine condition. (In real use the lenses probably would be set a bit further apart.) They're designed not to have lenses where normally you'd expect eyeglass lenses (they look as if supplemental lenses could be put there, but I've never found out if this was so). That's enough for now. Sorry for the deluge of pictures. Very nice, David. I see now Stan's loupe in better detail and I've realised he is also using the Bausch & Lomb double lens loupe.